The premium workmanship of the robust die-cast aluminum housing, coupled with the finest engineering materials and design, provides excellent protection against mechanical and electrical interference. This allows the balance to operate at the highest levels of precision, from the initial weigh-in period through the final result. With features such as self-calibration system and the intuitive user settable operation, the balance will handle any task you set for it. For more information, review the specifications of the individual balances. Technical specialists are on hand to assist you with any questions you might have. Analytical balances provide maximum weighing performance and are used for the accurate weighing of samples and precipitates. They are a class of balance designed to measure small masses in the sub-milligram range. How does an analytical balance work? Analytical scales measure the force needed to counter the mass of a sample rather than using actual masses. They use an electromagnet to generate a force to counter the sample and output the result by measuring the force needed to achieve balance. 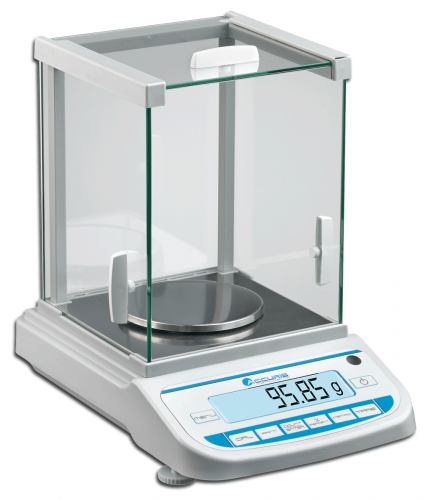 The measuring pan of an analytical balance (0.1 mg or better) is inside a transparent enclosure with doors, so environmental influences are blocked: that means dust does not collect and so any air currents in the room do not affect the weighing performance. What are analytical balances used for? An analytical balance is a basic tool in all quantitative analyses. The device is critical for differential weighing, density determination, pipette calibration, parts counting, animal weighing, check weighing, percent weighing, filling, gross-net-tare weighing, etc. An analytical balance provides accurate readings in educational, research, industrial, or quality control applications. What should I look for in an analytical balance? Each model has a range of capacities, linearity, readability, power source, stabilization time, calibrating type and other options. It is important to consider basic characteristics: capacity, readability, accuracy, functionality, sensitivity of the scales. Usually, balances provide weights in more than a dozen units, including grams, kilograms, pounds, newtons, grains, and ounces. An analytical balance can be connected to different gadgets, such as PC, a data printer, an analytical instrument using serial, parallel, or USB cables. To enable wireless communication, some modern models are equipped with Bluetooth technology. Some balances were designed for specific applications. What can I expect to pay for an analytical balance? As a device that provides maximum weighing performance, an analytical balance is not cheap; the cost of the scales can reach few thousand dollars. Less exacting models are cheaper. When choosing balances, try to find one that can handle the needs of your laboratory. Address your questions to experienced customer service staff and get all information required for purchasing an analytical balance designed for specific goals.